1) Should there always be a happy ending to a novel? 2) How many of the settings in your books have you actually visited? 3) Do you think that your early education gave you “food for thought” in developing plots, concepts or characters for your novels? 4) Where do you get inspiration for a story? 5) How did you start writing? 6) What started you into writing? I know that it is just a matter of time before your books turns into a screen movie. 7) How do you envision your hero in each book? 8) Does your significant other read your stuff? 10) Tell us about your recent release. I think I started reading my sister’s school books – she is 5 years older than me – and her story books were so much more interesting than the nursery school and kindergarten drivel they were tryuing to hand me! I atarted wrting stories (for myself, not just school assignments) when I was in Junior High School (7-9th grade) – I liked watching some of the action TV shows but was unhappy with some of the characters and scenerios, so I decided to write my own “plots”. My mom was the first to read my stuff but she really only liked “happy stories”. My favorite genre is Romance. Take a look at my blog site at http://chellecordero.blogspot.com for some samples and more about my writing. I start “plotting” scenes in my head – it’s just like all of a sudden I HAVE to get my thoughts down on something concrete. any fiction, then newspaper articles, – anything that puts an image in my head. Danielle Steele – I like her humility. The character has to have dimension, complex and real; also remember, NO ONE is all good or all bad so even the hero/heroine has to make stupid mistakes and even the villian is loved by someone. I think so – but lots of people usually don’t like taking the time to listen. Me. I like the idea of creating worlds and situations. Maybe I am a bit of a control freak! I do tend to write out my problems, but those writing exercises usually do not make it into my stories for public consumption. Does reader feed-back help you? Reader feed-back forces me to look at my stories and characters from different perspectives. It is very helpful. Do you participate in competitions? Have you received any awards? My books have been entered in competitions by my publisher – so far I’ve received some verbalk aclaim but no awards. Do you share rough drafts of your writings with someone whose opinion you trust? Parts of rough drafts especially when I am trying to work out logistics. Do you believe you have already found “your voice” or is that something one is always searching for? Uhm, I usually have to be sitting upright when I am at my desk. What do you surround yourself with in your work area in order to help your concentrate? Do you write on a computer? Do you print frequently? Do you correct on paper? What is your process? I type onto my computer – I hate to handwrite anything. After I get my thoughts on “paper”, I go back and edit. What sites do you frequent on-line to share experiences or information? Myspace, Facebook, Twitter and the Published authors forum. What has been your experience with publishers? My first experience was with a POD publisher that turned into a self-publisher and I felt ver disappointed in them – but the relationship didn’t last long and since I made no monetary investment, I didn’t get too hurt. Then I found Vanilla Heart Publishing and have been ecstatic ever since. Several projects – I am editing another romance novel, writing a possible ebook on marketing, and I also write NON-fiction articles for various publications. What do you recommend I do with all those things I wrote years ago but have never been able to bring myself to show anyone? Revise, rewrite, reread and let new ideas sprout. Go with them and take them out of the drawers. Use them as an idea file for today; past writings are a fantastic resource you have given yourself. How did you get started in writing? How difficult was your journey to publication? I actually got a start in professional writing when I volunteered with NYC’s Auxiliary Police Department. I worked with our PD liaison and he asked me to put together an article about a young man who had been murdered when he came to the aid of a mugging victim. The article was picked up by two newspapers, a local community weekly and my college paper. Hank, our PD liaison, taught me how to write press releases and work with the media. Prior to that, as far back as high school, I was privileged to have a creative writing class taught by the late poet Daisy Aldan. Ms. Aldan was very encouraging and taught me how to reach down deep inside and put my feelings on paper. I hear you have a new release, will you tell us about it? My latest “official” release (I’ll explain in a moment) is A Chaunce of Riches. In this book our heroine has to make a desperate decision where she forsakes the man she loves and her own dreams in order to help him, but he doesn’t know this – he only knows that she abandoned him. Years later the hero, who now works as a bodyguard/security consultant, meets up with the love of his life again. She’s been recently widowed, is quite wealthy, and the target of threats against her life and the welfare of her son. The hero is humiliated to be in her employ and tries unsuccessfully to deny his desire for her. They then find out that her wealthy husband was murdered and her former lover is the prime suspect. By the way, A Chaunce of Riches is available in both print and ebook. Since Vanilla Heart Publishing is a small traditional print publisher we tend to go by the release of books in print as the “official” dates. However my next novel, Common Bond, Tangled Hearts, is already available in ebook formats although the print copy won’t come out until February. Where did you come up with the concept for your story? LOL, I really don’t know. I am a rather random thinker and ideas seem to arise out of otherwise unrelated events. (My family knows to humor me…) I did wonder how far a woman would be willing to go and what she would be willing to do to protect the man she loves. Okay, say you have this great idea for a book, what do you do next? How much plotting do you do? I dwell on it for a while. I don’t lay out any outlines because I find that too confining. Eventually I create characters – when I create them I give them their own pasts and allow them to make their own decisions based on their experiences. By the time that I have scenes literally running through my head like snippets of a movie I know that it is time to start putting these thoughts on paper. Since I allow my characters to respond and write their own story, with only a little occasional corralling on my part, I try to write it in order of the events. Sometimes my characters really surprise me. In your opinion what are the most important avenues an author should take in promoting their works? Exposure. Retailers believe that the average consumer has to see a product about seven times before making a decision to purchase – so authors have to get their own name and the titles of their books out in front of the public frequently. I also see where you have a Kindle Blog Writing Workshop. Can you tell us about it and how Kindle users can sign up? I am very excited about the Kindle Blog Writing Workshop – this is a once a week lesson on various aspects of writing. I’ve posted articles about character development, blogging, making a business of writing, sending queries, promotion, overcoming writer’s block, and more. I also try to add a writing exercise and writing prompts with each workshop article. I often conduct in-person writing workshops. While I love the interaction and seeing my students face-to-face, it’s limiting because folks have to be in the area and the times have to be convenient for their schedules. The Kindle Writing Workshop allows many more people to utilize each of the lessons and they can do so whenever they have the time. 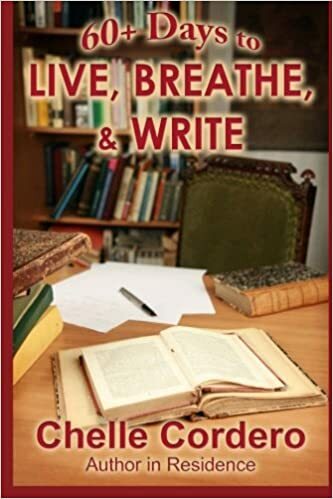 For just 99-cents a month (certainly less than the gas it would take to drive to a workshop), Kindle owners can subscribe to Living, Breathing, Writing at http://bit.ly/5RFlqv Each weekly lesson will be automatically downloaded onto your Kindle. What is one of the most memorable things that has happened to you since you’ve become a published author (for example: an awesome book signing or that one email you received from a reader that really made your day)? I will never forget the very first time that I was asked to autograph a copy of a book that a customer had purchased – I was absolutely amazed and very flattered. It was after a book discussion of my first novel with Vanilla Heart, Bartlett’s Rule. The customer made sure to tell me how much she enjoyed my writing and when she found out that my second book was on the market, she went right over to the counter and purchased that too. My ego simply soared. Now for a little fun! Do you have any unusual or not so unusual hobbies you’d care to tell us about? Scramble on Facebook! …and I talk to myself while I work. LOL. I volunteer with my local ambulance corps as a state certified Emergency Medical Technician and I sit on the Board of Directors. It’s very time consuming but I love knowing that I am serving an important purpose in my community. There is a euphoria when you see that you’ve been able to help someone during an emergency. And I can’t deny that seeing so many different types of emergencies helps me, as a writer, to come up with terrific ideas. What snack are we likely to see sitting next to your computer when you’re typing away on your next best seller? Usually a massive cup of herbal tea – my son and his gf gave me a 20-ounce cup for tea! Now and then I also like to chomp on crackers and cheese. What advice can you offer for any aspiring authors out there? Don’t ever give up. Regard rejections as a challenge to reach for more and not just a criticism about your work. Always keep your mind open to learn. And always have paper and pen nearby. Where can we purchase your books? And do you have a website we can visit? My books are available online at Amazon.com and Barnes and Noble.com as well as several other online retailers; there are also some brick and mortar shops that carry my titles on their shelves, just ask. You can also download ebook versions of all of my titles on Smashwords, All Romance and OmniLit. I’m on Facebook, MySpace and Twitter and I love to hear from my readers. Why don’t you start with telling us a little about yourself? What genre do you write in and why? I write mainly romantic suspense – I love trying to figure out “whodunit” and I consider myself to be a hopeless romantic. I like stories where people find and grow into love – to me true love is being realistic and knowing the other person (good and bad) and still wanting to spend your life with them. Tell me about your current book which you are promoting.Hyphema is really different from my usual work – it is a mystery thriller. The main characters are in love (married couple) but that is only a subplot to the story. The heroine, Sudah, is a Pakistani immigrant and practicing Muslim; American born Matt, her husband, is a NYS Paramedic turned North Carolinan Flight Medic. There is a lot if adrenaline pumping action, EMS style, and a lot of post-9/11 sentiment. How long have you been writing? I had my first newspaper article published when I was just 18. It took me a number of years (when I was pregnant with my first child) until I decided to pursue it as a serious career. I’ve been published in various newspapers and magazines (mostly non-fiction) since 1981. But I always wanted to “grow up to be a novelist”.I connected with Vanilla Heart Publishing in 2007 and my first novel, Bartlett’s Rule, was published in 2008. Nine novels and one writing guide later, I still enjoy my two writing personas – novelist and journalist, both under the name of Chelle Cordero. What got you interested in writing, and what inspired you to write your first book? I always had an overactive imagination and loved to make up stories as a child. My parents encouraged me to express myself through various art forms including writing. My sister and I wrote a poem about two Martians who wanted to get married and our folks had us “perform it” for all of the family.In High School I was lucky to get to study creative writing undr the tutelage of poet Daisy Alden. A few years later, while I was a volunteer in the NYC Auxiliary Police, I was mentored by Det Hank Spallone (he later became the mayor of Yonkers) in community affairs and learned about working with the media. I’ve always had stories inside me just waiting to be organized into manuscripts. I guess I finally had the confidence to pursue that part of my career. Do you outline before you write? If not, what’s your initial process? I start with an UNwritten premise and an idea of where I want to go. Then I birth a few characters, put the problems in front of them and see how they want to handle it. My characters tend to write their own stories and sometimes really surprise me. Which of your characters do you love/hate/fear/pity the most and why? Limiting myself to just my most recent book, Hyphema – I love the hero, Matt. First of all, I love his profession and his dedication to helping (I have a fondness for EMS personnel, I come from a family of paid and volunteer EMT’s & a Paramedic). Matt is very much in love with his wife and very loyal to his principles. – I pity Raja, Sudah’s cousin. She is so busy wanting what everyone has that she never appreciates anything she has. – I hate and fear the villain (NOT giving his name here) because his motives are so self-centered; he is convinced that he is entitled to be cruel. Did your book require a lot of research? How long does it take to write a book for you? This book required a lot of research into many, many areas. I was dealing with a culture and religion that I wasn’t personally familiar with and I wanted to portray it accurately. My story is very contemporary and I also as dealing with a character (Sudah) whose ethnicity and religious beliefs are often scrutinized in a post 9/11 world. I wanted to present her beliefs and the prejudices she encountered fairly ON BOTH SIDES and without preconceived notions.Matt’s character had been created in an earlier book and I build a lot of angst and habits into him as part of that story. I had to keep him consistent in Hyphema. I’ve been a NYS EMT for more than 2 decades and I understand what it is to work on a patient outside of a hospital setting; as a Paramedic Matt’s training is higher (but since my daughter is a paramedic I asked her a lot of technical questions). He is a flight medic and working on a patient in a helicopter is very different and not something I have ever seen in real life, so I had to speak to flight medics and try to see it through their eyes. What are some of the challenges in your writing process? Since I really do give my characters pretty free reign to decide their actions, sometimes they get a bit difficult to deal with, kind of like raising kids! Every so often I have to pull them back and sometimes we argue. It’s not pleasant when that happens. What do you like to do when you’re not writing? Spend time with my family, read, and volunteer with my local ambulance corps. 10. What books or authors have influenced your writing? I can honestly say that EVERY book I have ever read has influenced me and I’ve learned a little more about my craft. Right now two authors who have a great deal of influence on my writing are fellow VHP authors Charmaine Gordon and Janet Lane Walters. Charmaine, Janet and I have a roaming workshop program we present called TLC; even though we are “teaching” others, I think we tend to learn a lot from each other as well. What do you see for the future of publishing and e-books? While many still like the feel of a “real” book in their hands (myself included), e-books are quickly gaining in popularity because of cost, both in consumer purchasing and in publisher investment. Add to that the instant gratification and convenience of instant download and it’s a winning deal. What are your current books out right now and what are the books coming up for release? I have nine novels: Bartlett’s Rule; His Lucky Charm; Within the Law; Courage of the Heart; Final Sin; Hostage Heart; A Chaunce of Riches; Common Bond, Tangled Hearts; & Hyphema. I’ve begun work on my next book, a paranormal romantic suspense. What advice would you give a new writer just starting out? Never quit, never get discouraged and never let someone talk you out of trying. And remember that not everyone likes every book (do YOU like every book in a bookstore?) so it might take a few, or more, attempts to find a market for your work. Where can people learn more about you and your work? Folks can check out my website at http://ChelleCordero.com to find information about me, my books, buy links and my appearances. Click on “Media” on the menu bar for lots of background info as well.